This is a shot of a sunken boat between the pilings on the south side of Dillards bridge. You can clearly see on the side scan the outline of the boat. This is a picture of a school of Stripers I located and fished a couple of days ago. 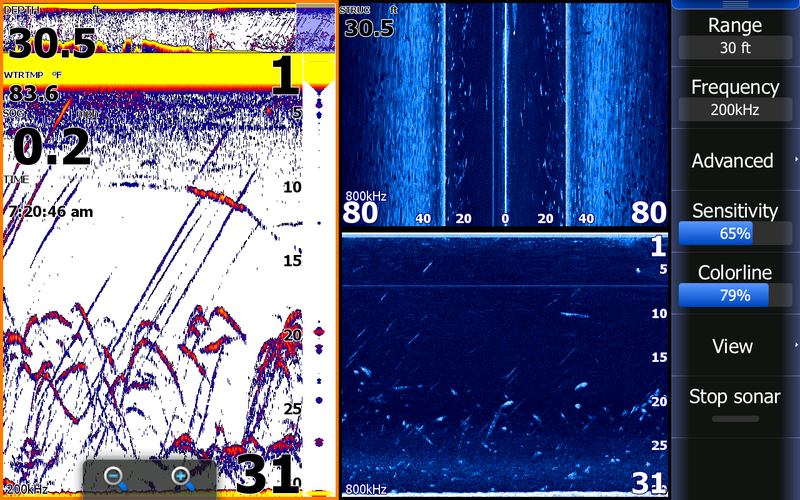 I was running about 25 mph over a hump on the left side of the sonar screen and when I hit the drop off I noticed Stripers right on the break before it fell into the channel. [Just above and to the right of the 6 in 20 to 30 feet of water] I immediately slowed down and turned the boat 180 degrees, shut the big motor down and coasted over the area while my clients jumped up and prepared to deploy downlines.You can see just to the left in the middle of the pic the smaller arches of the Striprs gradually getting larger. That's because when going fast the Stripers appear as small arches because I am traveling so fast over them but as the boat slows the pings read the fish better and are over the fish longer resulting in better arches. As you can see on the right side of the sonar screen I came up on a 30 foot flat where we proceeded to "Spank" the Stripers. The side scan [blue screen] shows the Stripers on both sides of the boat but more and larger fish are on the right side. You can see shadows created by the larger fish about 30 to 40 feet to the right and a couple nicer Stripers out about 80 feet to the right. You can also see in the middle of the screen on the top my prop wash when I went back over the area [white cloud]. Guess what direction I steered the boat to catch fish? This is a pic of of a nice school of Herring I located while looking for bait. You can clearly see the school on the sonar page ranging from 8 to 25 feet deep. The bait is extremely compressed [the denser the object the brighter or yellower the return] and easy to catch. Notice on the side scan there was more bait to the right side of the boat than the left side [Boat is currently at the top center of the blue screen at 0]. I threw off to the right and caught over two hundred baits in one cast, so heavy I had to get my client to help me lift the net. We had already used 200 baits that morning but the additional baits enabled us to limit out. On this screen I have customized my screen to instead of having my split screen in equal sizes I enlarged the bottom screen so I could see fish better which made my structure screen smaller. The way I have the screen with the side scan going all the way across the screen shows much more detail than if I had the screen split vertically as is evident in the two screen shots above this one. Today I caught bait early and picked my clients up at their dock. I looked for schools for an hour and found a nice one. We tried to get set up on them but with only two anglers it is about impossible to get all the baits out, reel in fish and bait quick enough to hold the fish. We popped a few of them but by the time we took the fish off the hooks all the baits had been hit and the school moved elsewhere. I knew then I would have to resort to fishing places rather than schools like I wanted to. We worked area after area and by 11 we had used up 175 baits. I went to catch bait, found a school and on my first cast caught over 200. We continued to fish different areas but the wind was howling over 25mph which gave me few places to set up on. All I really wanted to do was to put these two beautiful children on fish which I was able to do. We caught a whole lot of punks today but at this age they were excited just to see a rod bent over. They screamed every time a fish came on board. The kids reeled their fish in by themselves with very little assistance with the exception of the large fish which we had to touch the rod to keep the fish from tangling other lines up. This is a school of Stripers that we worked one morning last week. They were feeding on White Perch but we caught them on Herring. The diagonal dashes are the white perch getting out of Dodge. You can see up in my history bar up above the 1 on my sonar page that I had been on the school for a while. This is another shot of a school of Stripers where we caught some nicer fish. This shot is from when I was looking to catch daytime bait. Notice that I changed my screen to Side Scan on the upper half of my screen and Sonar on the bottom half. I did that because I could see more clearly out to the sides of my boat with the wider scan shot [as opposed to the screen in the top pic]. In the top screen my boat is currently at the top of the picture where that white vertical line is at 0. Halfway down on that screen on the left is a school of Herring 20 to 50 feet out to the left of the boat. I would not have located and caught that bait without side scan. Further down toward the bottom of the side scan screen is a school of bait [same school you see about halfway on my sonar page]. 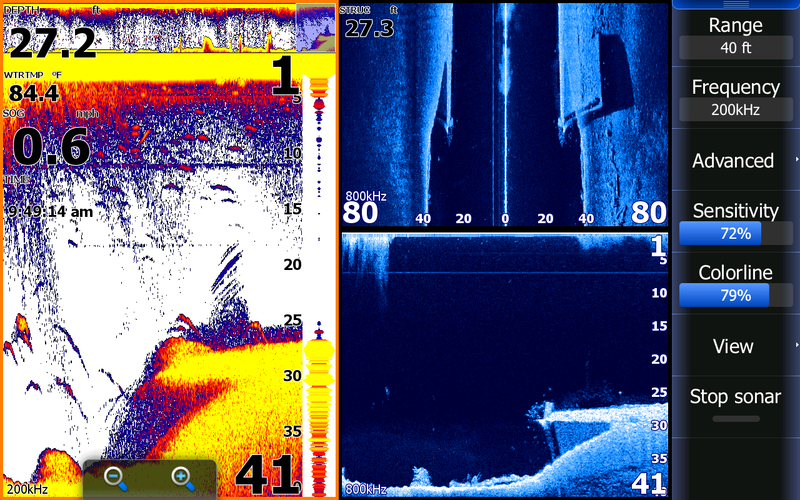 Notice on the side scan page that more bait was to the right side of the boat than on the left side. 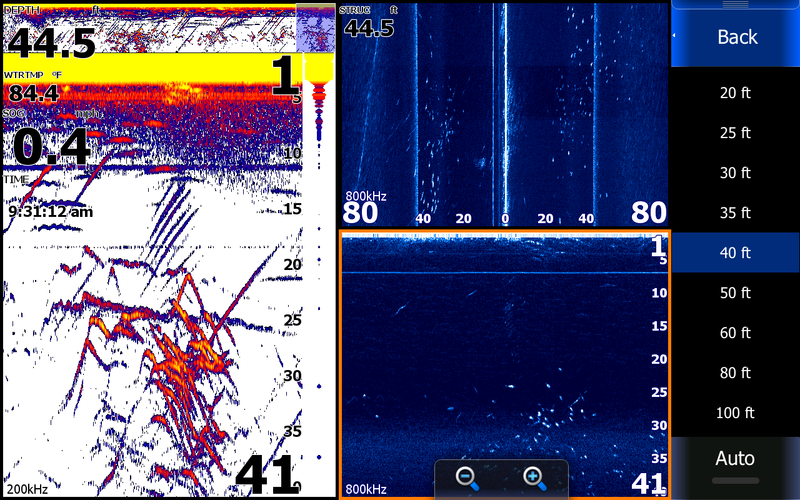 The occasional disturbance near the surface on my sonar page is the disturbance that my motor made as I try to locate the bait. 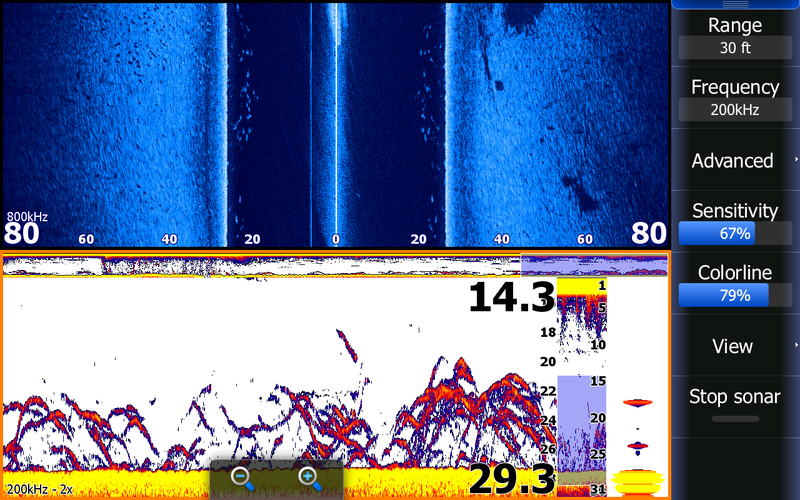 The side scan also shows the prop wash as a white cloud 2/3's of the way down over the 0 line where I had run over the bait and turned back around to catch it. Daytime bait can sometimes be difficult to catch but with Structure Scan technology it makes my life a lot easier. After burning up 200 baits that I caught pre-dawn I can catch more bait and eventually more fish. Greentop Sporting goods has Lowrance on display for you to play with and experienced salesmen to answer questions to help you catch more fish. DP took these Guys out this morning and put them on the Stripers. children and Chris won the raffle. God Bless the children. My grandson Michael had a friend from his baseball team down for a couple days so we tried to pack as many activities into 2 days as we could. Yesterday Michael wanted to run his bird dogs so we hit the woods at 6:30. After a couple jumps we gathered them up and they rode dirt bikes and 4 wheelers till it got about 93* outside. They were ready for the pool by then which lasted till 5. After a shower and dinner they were pooped and fell asleep watching a baseball game on TV. This morning when we got up it was raining so we were not in too much of a hurry to hit the water. It cleared up by 9 so I filled the tank and headed to the water. We hit the water at 10 and took 5 minutes to locate bait. Three throws later I had 200 baits, Sweet! We rode less than a half a mile and found a school of Stripers. I baited the rods, Michael put them down to the desired depth and before he could get another rod baited we would hook up and Christian would reel the fish in. While he was reeling it in Michael would bait and deploy another rod while I would net the fish and take it off the hook. We did that for 20 straight fish. Mike wanted his friend to reel in as many fish as he could. After all that action I noticed that I had never put my trolling motor down. I relocated the school, tried to get some baits wet but the fish would not let us get more than two rods out without hooking up. In less than an hour we had caught bait and boated 25 Stripers. It now looked like rain was coming so we put the rods up and I pulled them for 30 minutes on the tube then they went swimming for 15 more minutes while I emptied the bait tank. We were back at the marina by noon, took pictures and got home in time for lunch. Just doesn't get any better than that. Tony had the honer of taking these two boys out yesterday Striper fishing. the outdoors and the memories of the day. Today Tony and I had charters so we worked together to put our clients on fish. There were spells of pure chaos and time of patience trying to catch bait after we used up the early morning baits. It was a "catching" kind of day, the fish wanted to eat. This is a picture of Tony's clients taken at the marina. 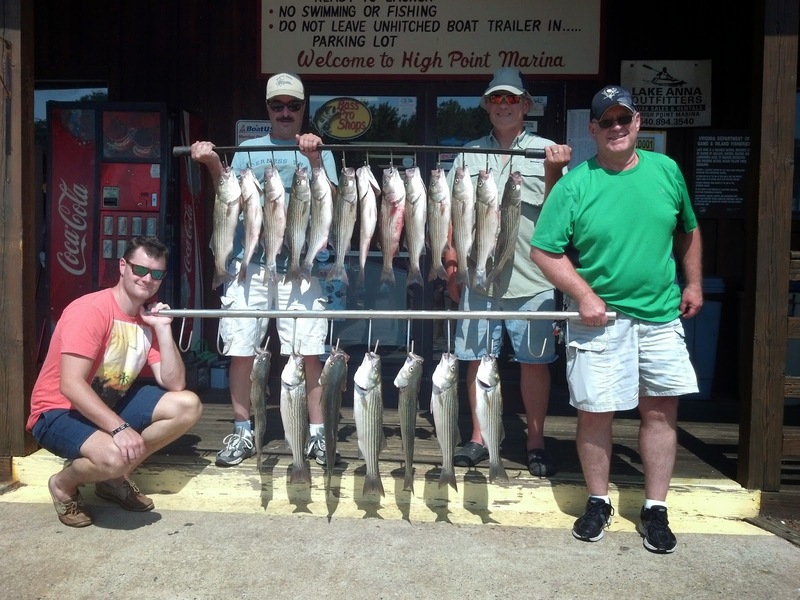 I picked my clients up at their dock and did not have a stringer large enough to hold all of our fish on the boat. I have my side scan set on the upper half of the screen and my sonar on the bottom. 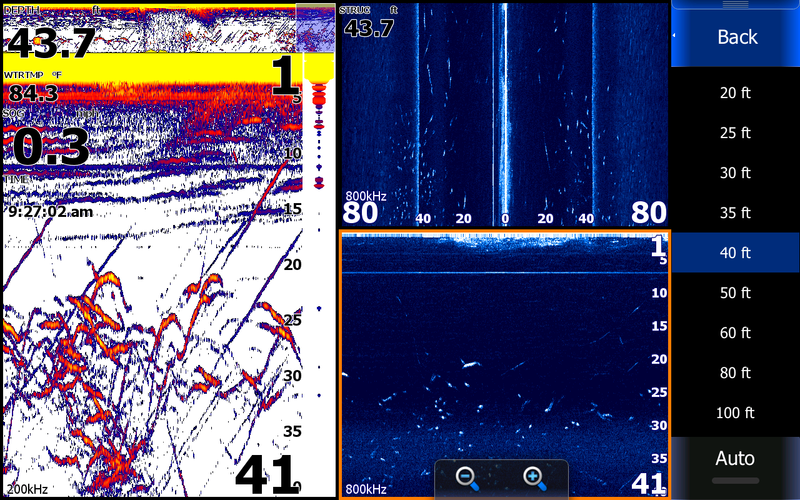 You can see Stripers on the sonar between 30 and 40 feet. The fish were feeding up over the 35 foot flat on the left side of the screen but once I got out over the deeper water they were inactive. I have my upper limit set to 13 feet because all the fish I saw were very deep. This is a school of feeding Stripers. We had numerous rods hooked up at once. 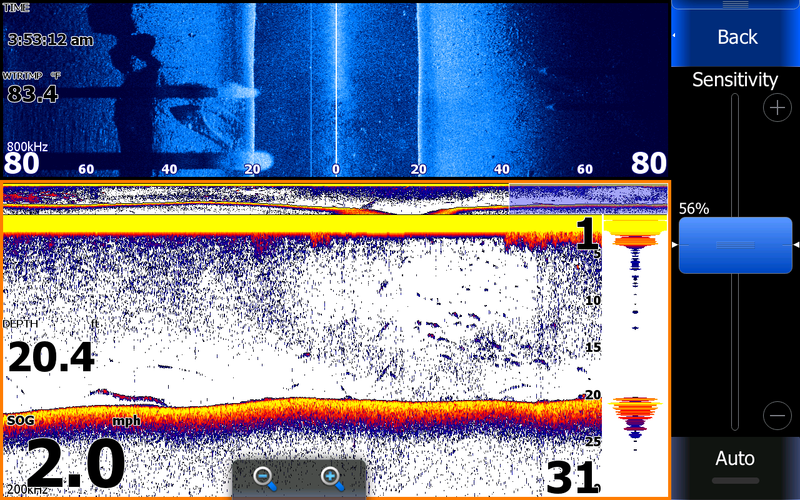 You can see quite a few fish out on the side scan as well. If you look up in my history bar at the top of the sonar page just above the 1 you can see the bulk of the school we were fishing. Notice all the streaking going on. The Stripers were feeding on White Perch. Most of the Stripers we caught that day were around schools of Perch. Here is another school of Stripers. 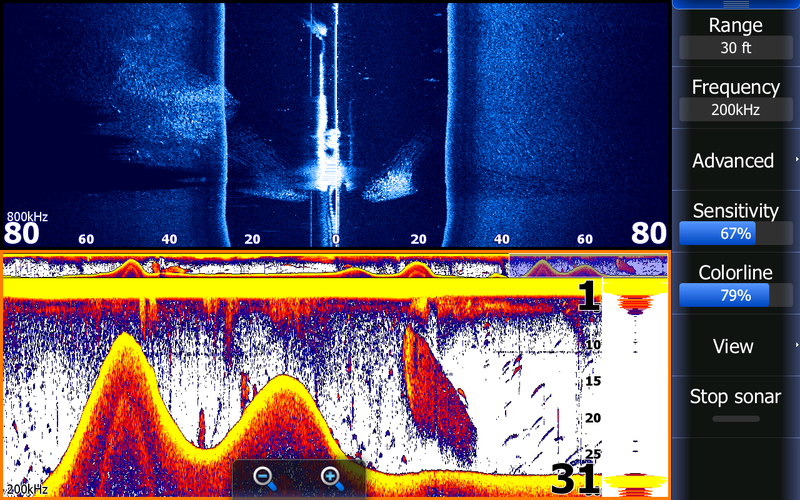 Notice my dead bait being drug through the water column at 25 feet on my sonar page. We had just boated a bunch of Stripers and had not had time to change out that bait. This is a picture of the road bed that parallels the 208 bridge. You can see how it is undercut when I come up from 40' to 27'. This is where the pavement stopped and the old bridge began. A couple of Bass are holding right on top of the road. How do I know they are Bass? We caught them. wanted to try it this morning so Tony took them out and "Spanked"
the Stripers. Tony thinks they caught almost 100 Stripers by 11. The Barr family better have plenty of room in the freezer! Today Tony and I had clients so we double teamed the Stripers today keeping our clients on fish. We hit numerous schools and went through about 600 baits today catching fish after fish. Everyone had fun today and there was plenty of fish to take home to eat. Both boats caught Largemouth Bass also. Lake Anna sure is a good fishery. Tony took this crew out today for some fun catching Stripers on the Lake. Tony and I worked together to put both our sets of clients on fish today. Today I caught bait before daylight then picked my clients up at High Point. I was surprised to see a long time client standing on the dock waiting to get into my boat. A friend of his had booked the trip and I was unaware that Jimmy Chen was going fishing today. He brought his son Carter with him and Patrick drug his dad Chris along to take fish off of his line. This was going to be great, two eager boys wanting to catch fish and two dads and myself to bait and take fish off the lines. We had a lot of action and a lot of fun using up the 200 baits that I caught this morning. We fished till we ran out of bait catching over 50 Stripers and a dozen Catfish. 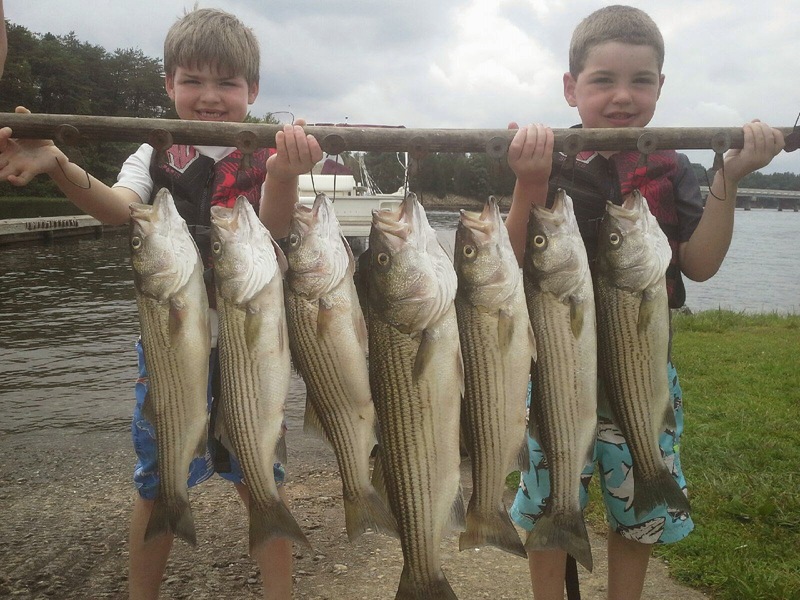 The boys are holding up a couple nice Stripers that they wrestled into the boat. Bet they can't wait to go again! Tony and I both had charters today. I had only three anglers and we limited out early this morning. Tony struggled a little early this morning but after lunch came back hard and put his clients on some nice Stripers. They ended up catching over 100 fish today, unfortunately a lot of the fish were under 20 inches. The short fish are fun to reel in and believe it or not most of our clients enjoy catching them as much as the big 'uns. This lake is a great fishery. Where can you constantly catch fish after fish, day after day, in the middle of the summer with generous creel limits of 4 Stripers per person per day? Thanks to the Dept. of Virginia Game and Inland Fisheries for managing Lake Anna to be such a great place to catch Stripers. 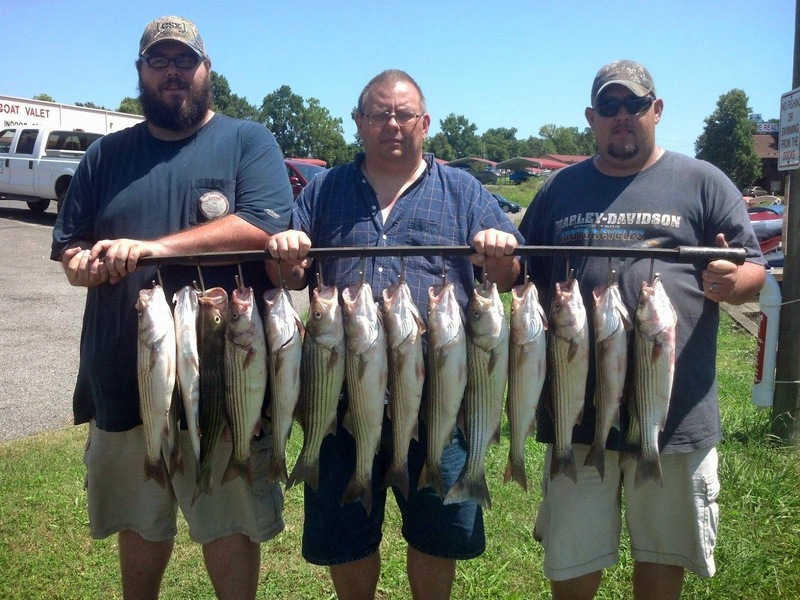 their limit of Stripers. We do half day trips in the evenings if any one wants to go. I took this motley crew out earlier in the week to catch some Stripers. We took a bunch of hits but the moon was not aligned with Venus correctly, the barometer was wrong, it was the wrong time of the month, a front was passing through, boat traffic was bad and I just sucked as a guide. I get spoiled catching so many fish on a daily bases that I get down when we don't limit out. Well today was one of those days and it happens to all of us.I could not locate the schools well and spent a lot of time on the big motor looking. Regardless of our stringer size we caught a lot of fish and had a lot of fun trying. These guys were great to be out on the water with and took home enough fish so their families would not starve the next couple of days. Tony did it again, he put these boys on some very nice Stripers. this morning. This will be a day the boys will always remember. Happy July 4th to all. Tony picked up his clients at their dock after catching a tank full of bait. Looks like they caught some great fish for just a morning charter. Luke is pictured holding his big Striper of the morning. That's a nice stringer of Stripers for a holiday weekend. This morning I picked up my clients and went looking for fish. We set up in an area where I knew some fish were working and before we knew it we were taking hits. We caught about 20 fish in our first school but 16 of them were punks. I left them and looked for bigger fish but had difficulty locating schools today. We eventually set up in different areas fishing "spots". We would catch a few here and there and sometimes have constant action. By noon Tyler had caught 11 Stripers and was on a roll. This was his first Striper trip and considering the heat he did exceptionally well. Although I considered today slow there was plenty of action to keep the boys out in 95* heat. I would have loved for them to catch 20 or 30 Stripers each but it just didn't work out that way today. We caught plenty of Catfish and got punked today.This will be a trip they will remember for a long time. This is a picture I took yesterday morning when I was working a school of Stripers. We had located and set up on them about 10 minutes prior to this picture. We had 8 rods hook up at once but by the time they took the fish off the hook the school had left. I fired the big motor up and went the direction I thought they were heading. About 200 yards away I ran over the school. On the left side of the sonar screen you can see a little motor noise interference [vertical black dashes] because I was running about 25mph. Just as soon as I saw the beginning of the school [ just on top of the ledge, smaller red dots] I put my shifter in neutral and as ran to the front of the boat to put trolling motor in while my clients got up and readied their rods for bait. I baited them, they put them down and 30 seconds later all the rods were hooked up. You can see on the sonar that as the boat slowed the arches got bigger and bigger. I had only slowed down to 1.1 mph but as I slowed even further after I took this shot the screen turned to spaghetti and that is when we hooked up. The sonar page works better than the down scan at speeds in excess of 5 mph as you can see in the picture. 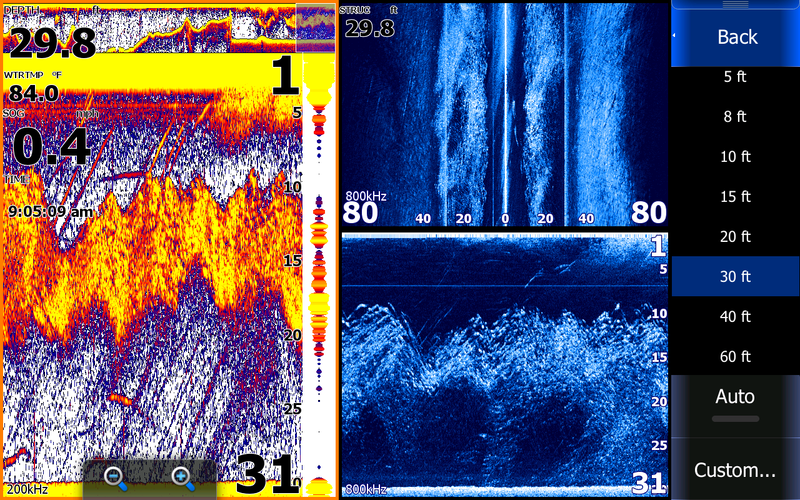 Once I slowed down enough the down scan picks up the fish as well as the side scan in the upper blue page. I then used the side scan to stay on the school by turning the boat 90 degrees and I maneuvered the boat in the direction that I saw most of the fish. I took this picture while I was catching daytime bait. 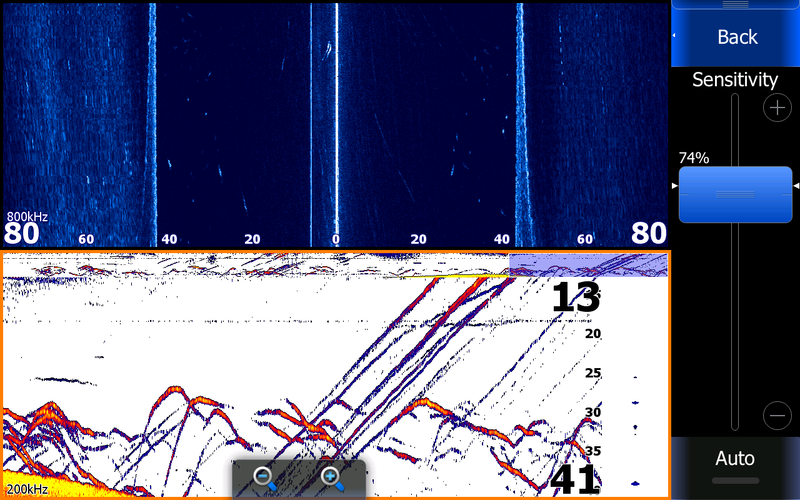 You can see on the sonar page all the Herring between 10 and 20 feet deep. On the history page in the upper part of the sonar page you can also tell how long I had been on the school which was massive, probably about 40 yards wide. 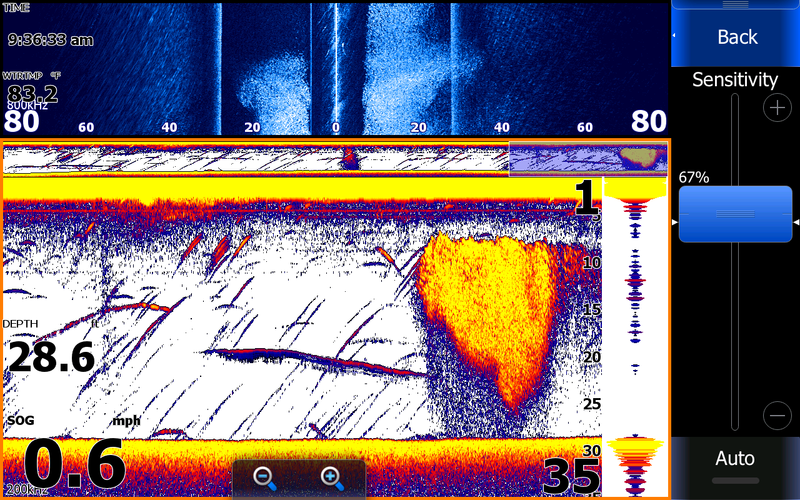 The down scan shows the bait as well but is showing more definition. Notice that I can see the individual baits clearly which helps me distinguish what kind of bait it is. 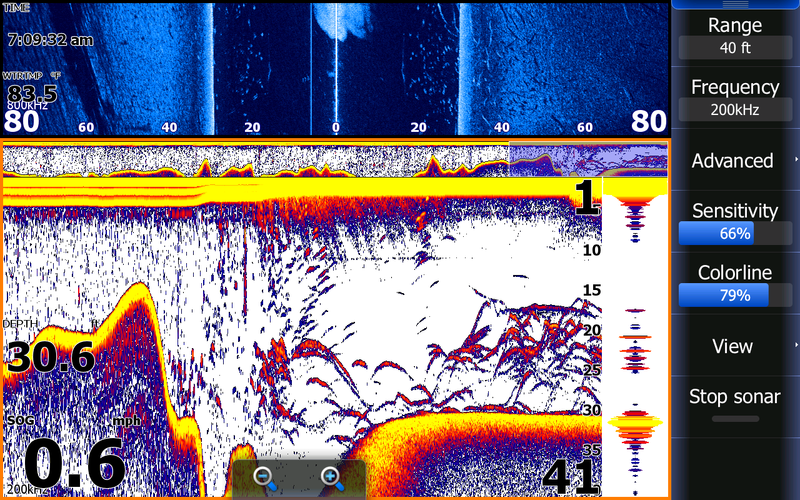 The side scan portion of the picture shows how wide the school of bait was and tells me there is more on the left side of the boat than the right so I threw on the left side of the boat and captured enough bait to finish the day. My journal shows a lot of pictures of Stripers but my Lowrance is the main tool I use in locating bait and fish to put my clients on. 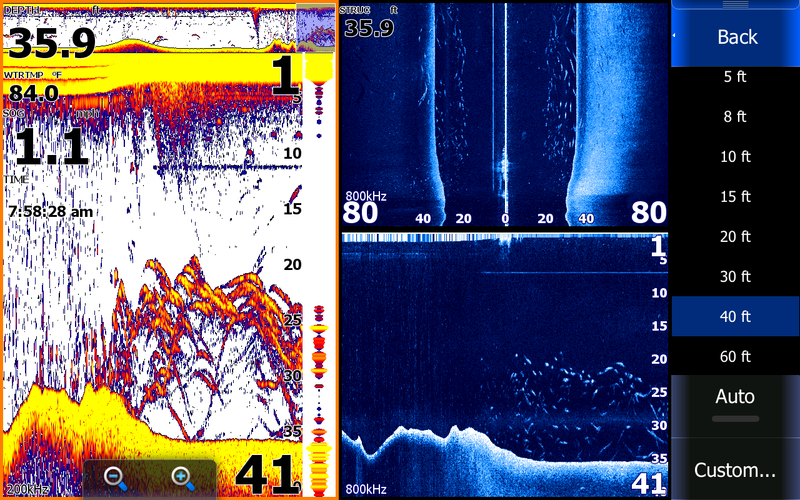 I have used Lowrance for over 40 years, always catching plenty of fish, but this technology and understanding how to use it and how to interpret what I see is one reason why we consistently put our clients on fish. If I could just get them to listen to me when a fish gets on my life would be a whole lot better. If you enjoy my posts of Lowrance shots let me know and I will continue to post them. If you have a Lowrance and have a question about it email me and I will try to help you. One of my guides Anthony Hicks and myself are Pro Staff Navico, which Lowrance is part of. If you want to learn more about reading and understanding Lowrance , consider booking a trip. When you leave at the end of the day you will know your depthfinder, how to locate, set up and catch fish and also have torn up thumbs from taking fish off the hook. Fishing is fun, Catching is the Bomb!